Thanks Shantell, Very cute! I'm just a little discouaged. I'll keep pluggig away. Maybe I can find a pic tomorrow. My older pics are on another computer and it's not plugged in right now. Here's mine. I hated him so much he's never been named. He's enormous; like three feet. Bleech. Shelli, beleive me or not, I don't think your first bear was bad! He looks so shy! Well, here is mine, from a Laurence Veron pattern. I have added a few personal features. 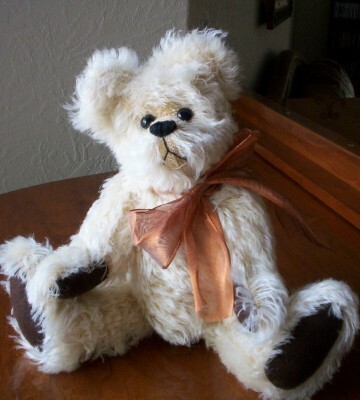 Oh Shelli's first bear is cute !!! Ok, here is mine.. boo hoo :redface: she has no mouth !! is adorable !!! not bad at all for first bear ! 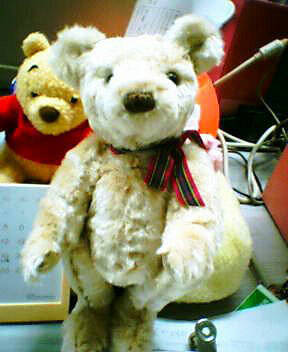 ok Shelli you so have nothing to worry about - my first bear has a smushed up face and is mde from nasty synthetic fabric. He's somewhere at my mother's house. All you guys first attempts are much better than mine! Jenn don't be discouraged - the only way is up!! Not that goodas yours but still the first one. 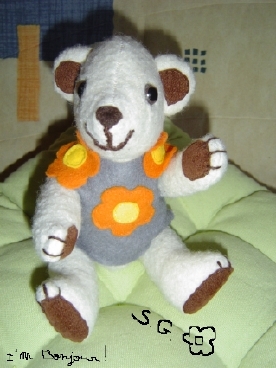 This is my 1st bear, made from a kit. SHELLI! I LOVE HIM! DONT THROW HIM OUT! i will give him a good home! He is adorable! Looking back is scarey...isn't it???????? Here she is, from September 2002. 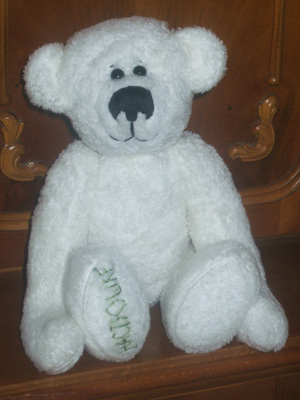 I am now working on bear #11 (I know, I'm slow). 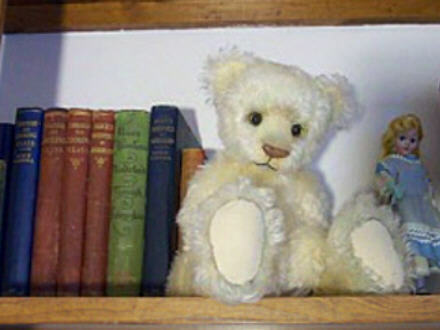 I don't think your bears are bad at all; I like them. I can't make a bear to save my life so I'm impressed that everyone here can. Finally finished my third but I am definately a beginner. 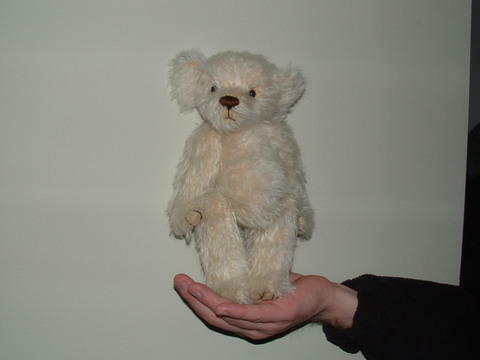 The very first mini bear I ever made (that was fabric, not crocheted) is floating around the house somewhere! 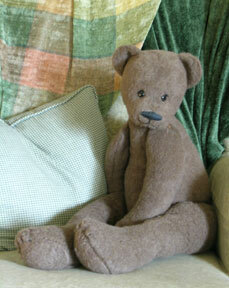 She was made from a pattern from a book of big bears, I just reduced it a whole lot. She's taupe colored upholstery velvet.... she has these big bug eyes! 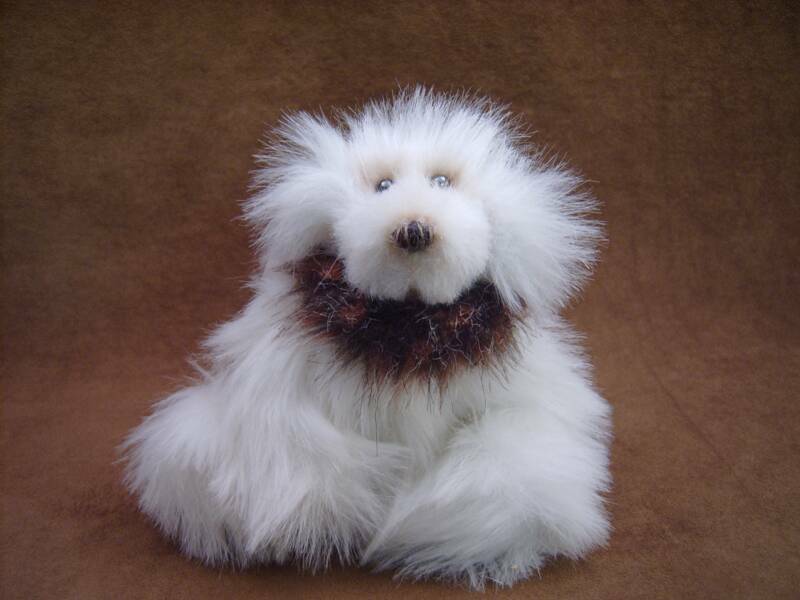 She was awful when I made her and still even more awful now.... she's been a doggie chew toy, had toothpaste smeared all over her head.... I never got rid of her, because my kids named her, and I just couldn't pitch her after that. She still turns up every so often when I decide to go down to the kids' recreation room in the basement and organize. Next time she surfaces, I'll have to take a few pics. 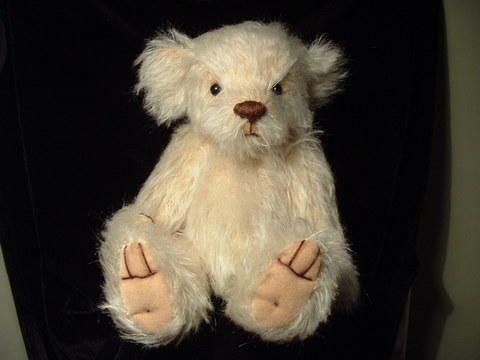 My first mohair bear was from my own design, and made of cream colored mohair. She's also a kid toy, and has been through a lot as well. Did you know that cherry flavored Robbitussin Children's Cough and Cold with decongestant makes a wonderful, completely PERMANENT mohair dye! 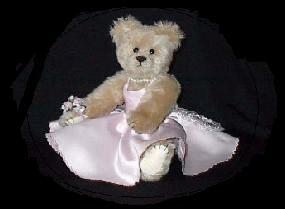 It's actually a lovely shade of pale pink that covers a large portion of poor Patina's rear! She's a regular guest at our tea parties around here, I'll have to snap a pic of her! Shelli.... she also has the same horrific affliction as your "Peaches" her legs and arms spin wildly if you so much as touch her! My first attempt at large cotter pin joints! She is certainly in the "well loved" category! And here she is.. making her photo debut... Patina!